Home Uncategorized Oh my word! Last month, a new writer emailed to thank me for a blog post that I had written back in 2010. Well! I had to go back in time and revisit this post for myself. I realized that the information is worth sharing again. When writing picture books, I strive to tell as much as possible in as little as possible. 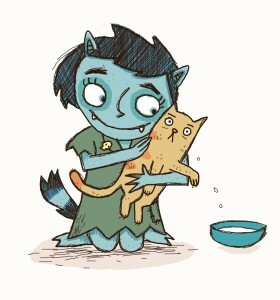 This helps me to leave plenty of room for the illustrator to do half the storytelling through the art. One of my key jobs is to use great words. Each word must count. Each word should be the best possible choice. I usually start with the name of my main character. With my book Mostly Monsterly, illustrated by Scott Magoon (Paula Wiseman/Simon & Schuster, 2010), for example, my main character is a monster. I didn’t want to give her just any name. Kate wasn’t right. Neither was Hailey. But Bernadette? Now, that was a name for a monster. Once I had my main character’s name, I did some brainstorming. I jotted down words that had a monsterly feel and would help set the tone for my story. Later, as I worked on the text, I drew from this list. Many of these words can be found on the first two-page spread of Mostly Monsterly. Not all of the words from my list, however, made it into the story. If a word didn’t add to the character development or storyline in some way, that word was not included. 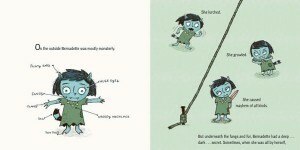 Also, since my picture books are humorous, I like to choose words that sound funny. This helps to create a more satisfying read aloud experience. In Mostly Monsterly, for instance, the words “fangs” and “slobber” made their way into the text. “Teeth” and “spit” did not. These are just a few of the things I do when it comes to selecting the right words. I want my picture books to sing! Or, in the case of Mostly Monsterly, grumble and growl. 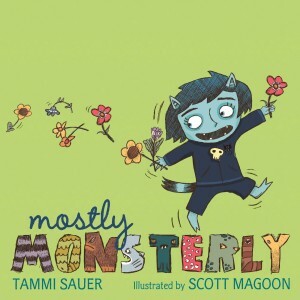 Mostly Monsterly, Scott Magoon, Tammi Sauer. Bookmark. Thank you for this mini lesson, Tammi Sauer! Explains why your books are so marvelously magical! Ha! I thought this was written by Matthew Winner, with the catch phrase, “Oh, my word!” Great post, Tammi. Your PBs make wonderful mentor texts for word choice (and pacing and character development and…). Wow! Thank you. 🙂 I’m so glad my PBs have been helpful to you. SO true! And brainstorming is one of the best exercises I’ve found for writing picture books–great for generating fantastic words, like lurch and slobber! Plus, we can always make up some good words here and there. Great post, Tammi! I love the idea of brainstorming words before even starting to write. Thanks for the inspiration! Sometimes starting a brand new manuscript can be really daunting. Brainstorming words? That seems much more manageable. Thank you, Tammi! This lesson-ette is just what I need right now as I dive into a new manuscript. Brainstorming really goes a long way! Oh, good! Best of luck with that new manuscript! 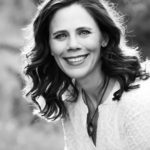 Me, too–two new PBs in progress, so that’s a great place to start! Thanks for showing your processing of word choice, Tammi! You’re welcome, Tina! I’m so glad you are a regular at visiting our blog. I’m happy this post was helpful to you and that your grandson is a fan of NUGGET & FANG.